For the English cricketer, see Philip Knight (cricketer). For the footballer, see Phillip Knight (footballer). Chairman Emeritus - Nike, Inc.
Phil Knight was born in Portland, Oregon, the son of lawyer turned newspaper publisher Bill Knight, and his wife Lota (Hatfield) Knight. Knight grew up in the Portland neighborhood of Eastmoreland, and attended Cleveland High School. According to one source, "When his father refused to give him a summer job at his newspaper [the now defunct Oregon Journal], believing that his son should find work on his own," Knight "went to the rival Oregonian, where he worked the night shift tabulating sports scores and every morning ran home the full seven miles." Knight continued his education at the University of Oregon (UO) in Eugene, where he is a graduate brother of Phi Gamma Delta fraternity, was a sports reporter for the Oregon Daily Emerald and earned a journalism degree in 1959. As a middle-distance runner at UO, his personal best was 1 mile (1.6 km) in 4 minutes, 10 seconds, and he won varsity letters for his track performances in 1957, 1958 and 1959. In 1977, together with Bowerman and Geoff Hollister, Knight founded an American running team called Athletics West. Before the Blue Ribbon Sports business that would later become Nike flourished, Knight was a Certified Public Accountant (CPA), firstly with Coopers & Lybrand, and then Price Waterhouse. Knight then became an accounting professor at Portland State University (PSU). Immediately after graduating from the University of Oregon, Knight enlisted in the Army and served one year on active duty and seven years in the Army Reserve. After the year of active duty, he enrolled at Stanford Graduate School of Business. For his small business class, Knight produced a paper, "Can Japanese Sports Shoes Do to German Sports Shoes What Japanese Cameras Did to German Cameras?," that essentially premised his eventual foray into selling running shoes. He graduated with a master's degree in business administration from the school in 1962. Knight set out on a trip around the world after graduation, during which he made a stop in Kobe, Japan, in November 1962. It was there he discovered the Tiger-brand running shoes, manufactured in Kobe by the Onitsuka Co. Impressed by the quality and low cost of the shoes, Knight called Mr. Onitsuka, who agreed to meet with him. By the end of the meeting, Knight had secured Tiger distribution rights for the western United States. The first Tiger samples would take more than a year to be shipped to Knight; During that time he found a job as an accountant in Portland. When Knight finally received the shoe samples, he mailed two pairs to Bowerman at the University of Oregon, hoping to gain both a sale and an influential endorsement. To Knight's surprise, Bowerman not only ordered the Tiger shoes, but also offered to become a partner with Knight and provide product design ideas. The two men agreed to a partnership by handshake on January 25, 1964, the birth date of Blue Ribbon Sports (BRS), the company name that would later be transformed into Nike. Knight's first sales were made out of a now legendary green Plymouth Valiant automobile at track meets across the Pacific Northwest. By 1969, these early sales allowed Knight to leave his accountant job and work full-time for Blue Ribbon Sports. Jeff Johnson, employee number one of Nike, suggested calling the firm "Nike," named after the Greek winged goddess of victory. Blue Ribbon Sport was renamed Nike in 1971. Nike's "swoosh" logo, now considered one of the most powerful logos in the world, was commissioned for a mere US$35 from graphic design student Carolyn Davidson in 1971. According to Nike's website, Knight said at the time: "I don't love it, but it will grow on me." In September 1983, Davidson was given an undisclosed amount of Nike stock for her contribution to the company's brand. On the Oprah television program in April 2011, Knight claimed he gave Davidson "A few hundred shares" when the company went public. During his time at Nike, Knight developed close personal relationships with some of the world's most recognizable athletes, including Michael Jordan and Tiger Woods. Following mainstream success in the late 1990s, the animation company Will Vinton Studios experienced very rapid growth and Vinton needed to court external investors—Knight was one of the wealthy businessmen that he approached. Knight subsequently assumed a 15 percent stake in the company in 1998 and facilitated the employment of his son Travis, who had graduated from PSU following an unsuccessful attempt at a rap music career, as an animator. Following a period of severe mismanagement, Knight eventually purchased Will Vinton Studios and assumed control of the company's board with the cooperation of Nike executives. In late 2003, Knight appointed his son to the board, who had proven himself as an adept animator since joining the company, and after Vinton stepped down from the board—prior to leaving the company with a severance package—Knight rebranded the company Laika. Knight invested US$180 million into Laika following Vinton's departure and the studio released its first feature film, Coraline (in stop motion), in 2009. Coraline was a financial success and Travis Knight was promoted into the roles of Laika CEO and President in the same year. In May 2004, two years after Knight bought Vinton, his son Matthew, aged 34 years, traveled to El Salvador to film a fund-raising video for Christian Children of the World, a Portland nonprofit organization. However, while scuba diving with colleagues in Lake Ilopango, near San Salvador, he died immediately from a heart attack 150 feet (46 m) underwater due to an undetected congenital heart defect. Knight and Travis traveled to El Salvador to return Matthew Knight's body to the U.S. and Travis explained in 2007, "It brought the family closer. You realize all this can go away in a minute." Laika Studio's 2005 short film Moongirl was dedicated to Matthew's memory. Knight resigned as the CEO of Nike on November 18, 2004, several months after his son Matthew's funeral, but retained the position of chairman of the board. Knight's replacement was William Perez, former CEO of S.C. Johnson & Son, Inc., who was eventually replaced by Mark Parker in 2006. In 2011, the Matthew Knight Arena at the University of Oregon was named in his honor. During the 2009-2010 period, Knight was the largest single contributor to the campaign to defeat Oregon Ballot Measures 66 and 67, which, once passed, increased income tax on some corporations and high-income individuals. According to a February 10, 2012 filing by attorney John F. Coburn III, on behalf of Knight, Knight owned 67,097,005 shares of Class A Common Stock and 7,740 shares of Class B Common Stock in the Nike corporation. In June 2015, Knight and Nike announced that he would step down as the company's chairman, with president/CEO Mark Parker to succeed him. However, a date had not been set for his departure, and he said he plans to remain involved in the company. Knight's retirement from the Nike board took effect at the end of June 2016. However, in September 2017, Knight decided to come out of retirement to put black back in the UNC jerseys for the Phil Knight Classic in Portland, Oregon. Knight's memoir, Shoe Dog, was released on April 26, 2016 by Simon & Schuster, was rated fifth on The New York Times Best Seller list for business books in July 2018, and details the building of the Nike brand, from importing Japanese shoes to being part of a federal investigation. As of 2016, according to Portland Business Journal, "Knight is the most generous philanthropist in Oregon history. His lifetime gifts now approach $2 billion." In 2006, Knight donated US$105 million to the Stanford Graduate School of Business, which, at the time, was the largest ever individual donation to a U.S. business school. The campus was named "The Knight Management Center," in honor of Knight's philanthropic service to the school. In 2016, it was announced that Knight contributed $400 million to start the Knight-Hennessy Scholars graduate-level education program. The program will admit up to 100 students with demonstrated leadership and civic commitment each year and is inspired by the Rhodes Scholarship. Over 80% of the endowment will cover living expenses and education at one of the seven graduate schools at Stanford; the graduates are charged to tackle global challenges such as climate change and poverty. The first class of 51 scholars from 21 countries will arrive at Stanford in the fall of 2018. The scholars' academic experience will focus on both subject-specific knowledge and leadership development so that they can be prepared to address global challenges. Knight has donated hundreds of millions of dollars to the University of Oregon. Major gifts include funds supporting the renovation of the Knight Library and construction of the Knight Law Center. Knight also established endowed chairs across the campus. In the fall of 2016, it was announced that Knight will donate $500 million to UO for a new three-building laboratory and research science complex. This donation was part of a series of large higher-education gifts. In August 2007, Knight announced that he and his wife would be donating US$100 million to found the UO Athletics Legacy Fund to help support all athletic programs at the university. In response, Athletic Director Pat Kilkenny said: "This extraordinary gift will set Oregon athletics on a course toward certain self sufficiency and create the flexibility and financial capacity for the university to move forward with the new athletic arena." At the time, the donation was the largest philanthropic gift in the history of the university. The 2010 construction of the UO basketball team's facility, Matthew Knight Arena, was the result of a partnership between Knight and former Oregon Athletic Director Pat Kilkenny. Although Knight didn't pay for the project directly, he established a $100 million "Athletic Legacy Fund." The fund supports the athletic department. Named after Knight's deceased son, the venue replaced the McArthur Court building and its cost of over US$200 million to build. The facility was built using bonds backed by the State of Oregon. Knight was responsible for financing the UO's US$68 million 145,000 square-foot gridiron football facility that was officially opened in late July 2013. Knight's personal locker in the team's locker room displays the title "Uncle Phil", and other features include a gym with Brazilian hardwood floors, Apple iPhone chargers in each of the player's lockers, various auditoriums and meeting rooms, a games room for the players that includes flat-screen televisions and foosball machines, and a cafeteria. In November 2015, it was announced that Knight and his wife would be donating $19.2 million towards a new sports complex project at the University of Oregon. The plans for the 29,000 square foot complex was announced in September. Construction began in January 2016 and end in September 2016. The sports complex was named the Marcus Mariota Sports Performance Center and includes motion capture systems, neurocognitive assessment tools, 40-yard dash track, and steam machines made by Nike to help athletes break into their footwear more quickly. In October 2016, Knight and his wife invested $500 million to build a new campus dedicated to science, called the Phil and Penny Knight Campus for Accelerating Scientific Impact. Three new buildings will be constructed and will provide 750 family-wage jobs once it is completed and fully operational. However, Knight's contributions to the Athletic Department at UO have also led to controversy. In April 2000, student body leaders began organizing an anti-sweatshop and fair labor practices campaign, and called for Dave Frohnmayer, president of the school, to support the Workers Rights Consortium (WRC). On April 4, 2000, students began a sit-in at Johnson Hall, the UO's administrative center. In early April, an open meeting of students further demanded that the organization Fair Labor Association (FLA) would receive no consideration from the university, as it was perceived as a group founded, funded and backed by Nike and other corporations, and had also been criticized by worker rights advocates as an exercise in dishonest public relations. ... he would refuse to pay dues to the WRC based on a legal opinion from UO General Counsel Melinda Grier arguing that to do so would be illegal and open the university to liability. Grier claimed the WRC had not yet incorporated, had not yet filed as a non-profit, and served no public purpose justifying a dues payment. On February 16, 2001, the Oregon University System enacted a mandate that all institutions within the system choose business partners from a politically neutral standpoint, barring all universities in Oregon from joining either the WRC or the FLA. Following the dissolved relationship between the university and the WRC, Knight reinstated the donation and increased the amount to over US$50 million. Also controversial was Knight's success in lobbying for former insurance executive Pat Kilkenny to be named as athletic director at the university. Kilkenny had neither a college degree nor any prior experience in athletics administration. He attended but did not graduate from UO, as he left the school with several credit hours still owing. Prior to his appointment at UO, Kilkenny had been the chairman and chief executive officer of the San Diego, U.S.-based Arrowhead General Insurance Agency, and grew the business into a nationwide organization, with written premiums of nearly US$1 billion when he sold the company in 2006. In October 2008, Knight and his wife pledged US$100 million to the OHSU Cancer Institute, the largest gift in the history of Oregon Health & Science University. In recognition, the university renamed the organization the "OHSU Knight Cancer Institute." In October 2010, Knight donated several million dollars to the Catlin Gabel School to establish a scholarship for incoming freshmen students. On May 18, 2012, Knight contributed US$65,000 to a higher education Political Action Committee (PAC) formed by Columbia Sportswear CEO Tim Boyle. According to Boyle, the PAC will help facilitate an increase in the autonomy of schools in the Oregon University System. In the fall of 2014, it was reported in the media that Knight would donate up to $1 billion to UO's endowment fund. However, these rumors did not materialize. On September 27, 2013, Knight surprised the audience at the OHSU Knight Cancer Institute's biennial gala, when he announced his intention to donate US$500 million for research if OHSU could match it over the subsequent two years. On June 25, 2015, OHSU met that $500 million goal, and Knight announced his upcoming $500 million donation, to bring the total to $1 billion raised. Knight and wife Penny also donated to the Marylhurst Knights Opportunity Scholarship Program at Marylhurst University, a private Roman Catholic university in Marylhurst, Oregon; as a result, the university named a lawn on their campus "Knight's Green" in the family's honor. In December 2016, Knight disclosed that he had gifted $112 million in Nike stock to charity. In 2000, Knight was inducted into the Oregon Sports Hall of Fame for his Special Contribution to Sports in Oregon. At the time of his induction, he had contributed approximately US$230 million to UO, the majority of which was for athletics. On February 24, 2012, Knight was announced as a 2012 inductee of the Naismith Memorial Basketball Hall of Fame as a contributor. The Hall recognized him as the driving force behind Nike's huge financial support of U.S. basketball and its players. Knight was formally inducted on September 7, 2012. For his "contributions to business, corporate and philanthropic leadership", Knight was elected to the 2015 American Academy of Arts and Sciences membership class. Knight met his wife, Penelope "Penny" Parks, while he was working at Portland State University and the pair were married on September 13, 1968. They own a home in La Quinta, California. Knight donated almost $3.5 million to Republican Knute Buehler's unsuccessful 2018 Oregon gubernatorial campaign. ^ "Phil Knight & family". Forbes. ^ Brettman, Allan (May 5, 2016). "Phil Knight's memoir emphasizes family, glosses over controversy (review)". OregonLive. The Oregonian. Retrieved November 28, 2018. ^ "Nike's Knight, 77, handing off chairman duties". ^ "Forbes 400: Phil Knight". Forbes. Retrieved August 13, 2018. ^ Rogoway, Mike. "Phil and Penny Knight's charitable contributions top $2 billion". The Oregonian. Retrieved July 11, 2017. ^ a b c d Krentzman, Jackie (1997). "The Force Behind the Nike Empire". Stanford Magazine. Archived from the original on June 25, 2010. Retrieved May 28, 2008. ^ "Phil Knight". Accessed May 13, 2012. ^ Susan Hauser (4 May 1992). "Must Be the Shoes". People. Accessed 12 January 2018. ^ "Phi Gamma Delta". www.phigam.org. Retrieved February 1, 2019. ^ magazine, STANFORD. "The Force Behind the Nike Empire". stanfordmag.org. Retrieved February 1, 2019. ^ "Notable Oregonians: Phil Knight — Innovator, Business Leader". Oregon Blue Book. Retrieved June 1, 2008. ^ Jeed S (November 4, 2010). "History of Athletics West". A Pride As An Asian. Wordpress. Retrieved December 12, 2014. ^ Anne M. Peterson, "Nike's Phil Knight resigns as CEO," Seattle Times, November 19, 2004. Accessed May 13, 2012. ^ a b "Nike History and Timeline". University of Virginia. Retrieved September 28, 2015. ^ "History & Heritage". Nike, Inc. Nike. 2014. Archived from the original on May 15, 2014. Retrieved May 19, 2014. ^ Knight, Phil (2017). Shoe Dog: Young Readers Edition. Simon and Schuster. pp. 229–230. ISBN 9781534401181. ^ Vinton, Kate. "Phil Knight's Net Worth Jumps $1.9 Billion After Announcement Of Nike Deal With Amazon". Forbes. Retrieved October 1, 2017. ^ "Nike gives board seniors the boot". BBC. August 2, 2004. Retrieved June 28, 2009. ^ "What Does the Nike Logo Mean?". Archived from the original on March 24, 2015. Retrieved September 6, 2016. ^ "Nike Founder Phil Knight Talks Working With MJ, Tiger Woods +More". HotNewHipHop. Retrieved July 12, 2018. ^ "Phil Knight talks about why Nike is standing behind Tiger Woods". Washington Examiner. December 14, 2009. Retrieved July 12, 2018. ^ a b Zachary Crockett (May 9, 2014). "How the Father of Claymation Lost His Company". Priceonomics. Priceonomics. Retrieved May 19, 2014. ^ a b c Salter, Chuck (December 19, 2007). "The Knights' Tale". Fast Company. Retrieved October 27, 2009. ^ https://www.facebook.com/comicriffs. "The rise of Travis Knight, the son of Nike's founder who built an animation powerhouse". Washington Post. Retrieved October 1, 2017. ^ Peterson, Anne M. (November 19, 2004). "Nike's Phil Knight resigns as CEO". The Seattle Times. Retrieved June 1, 2008. ^ Dash, Eric (November 19, 2004). "Founder of Nike to Hand Off Job to a New Chief". The New York Times. Retrieved June 1, 2008. ^ Barbaro, Michael; Dash, Eric (January 24, 2006). "Another Outsider Falls Casualty to Nike's Insider Culture". The New York Times. Retrieved June 2, 2008. ^ "Oregon basketball: Emotions high as Phil Knight opens Matthew Knight Arena". OregonLive.com. Retrieved April 3, 2017. ^ "The closing tally on the Measures 66 and 67 campaigns: $12.5 million". ^ John F. Coburn III (February 13, 2012). "NIKE INC Filed by KNIGHT PHILIP H" (PDF). FORM SC 13G/A (Amended Statement of Ownership). EDGAR Online, Inc. Retrieved May 19, 2014. ^ Sell, Sarah Skidmore (June 30, 2016). "Nike Co-Founder Phil Knight Retires From Board". ABC News. Associated Press. Retrieved July 1, 2016. ^ Stynes, Tess (June 30, 2016). "Nike Co-Founder Phil Knight Officially Retires as Chairman". The Wall Street Journal. Retrieved July 1, 2016. ^ "Books Best Sellers - Business". nytimes.com. The New York Times. Retrieved October 16, 2018. ^ Jones, Riley. "Nike Co-Founder Phil Knight's Memoir Just Got a Release Date". Complex.com. Complex. Retrieved February 17, 2016. ^ Gates, Bill. "An Honest Tale of What It Takes to Succeed in Business". gatesnotes.com. Retrieved April 14, 2017. ^ Kish, Matthew Portland Business Journal: "As philanthropy ramps up, Phil Knight gifts $112 million in Nike stock", 28 December 2016. 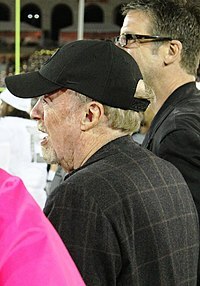 ^ "Nike Founder Phil Knight to Give $105 Million to Stanford GSB". Stanford Graduate School of Business. Retrieved January 24, 2017. ^ Stanley, Alessandra (February 24, 2016). "Philip Knight of Nike to Give $400 Million to Stanford Scholars". New York Times. Retrieved February 24, 2016. ^ Garcia, Ahiza. "Nike's Phil Knight gives $400 million to Stanford University". CNN Monday. CNN Money. Retrieved February 24, 2016. ^ Amini, Mariam (March 3, 2018). "Alphabet's John Hennessy talks about helping international students with scholarships". CNBC. ^ Brettman, Allan (August 12, 2014). "Phil and Penny Knight, thanks to Nike fortune, have given more than $1 billion in philanthropy". The Oregonian. ^ Theen, Andrew. "Phil and Penny Knight will give $500 million to University of Oregon for science complex". The Oregonian. Retrieved October 18, 2016. ^ "JOHN HARVARD'S JOURNAL Brevia". Harvard Magazine. January – February 2017. Retrieved January 31, 2017. ^ Associated Press (August 21, 2007). "Knight's $100 million gift to bankroll Oregon athletics fund". ESPN College Sports. ESPN Internet Ventures. Retrieved May 19, 2014. ^ a b Bolt, Greg (January 4, 2011). "Legacy Fund gives UO a leg up on financing". The Register-Guard. Retrieved February 25, 2016. ^ Tony Manfred (July 31, 2014). "Oregon's New $68-Million Football Facility Is Like Nothing We've Ever Seen In College Sports". Business Insider. Business Insider, Inc. Retrieved May 19, 2014. ^ Tony Manfred (September 20, 2013). "Phil Knight Has His Own Locker In Oregon's New $68-Million Football Facility". Business Insider. Business Insider, Inc. Retrieved May 19, 2014. ^ Tony Manfred (August 1, 2013). "New Photos From Inside Oregon's Monstrous $68-Million Football Facility". Business Insider. Business Insider, Inc. Retrieved May 19, 2014. ^ Associated Press. "Nike co-founder donates millions for new UO sports complex named after Mariota". Associated Press. Associated Press. Retrieved December 3, 2015. ^ "Oregon Ducks say Marcus Mariota Sports Performance Center's function matches its flash". OregonLive.com. Retrieved April 14, 2017. ^ Staff, KATU.com. "Phil Knight donates $500M for new science center at University of Oregon". KATU. Retrieved April 14, 2017. ^ Press, Keaton Thomas, KATU News and Associated. "Nike co-founder pledges $500 million to University of Oregon". KATU. Retrieved April 14, 2017. ^ Fish, Mike (January 13, 2006). "Just do it!". ESPN.com. Retrieved June 1, 2008. ^ Sachie Hopkins-Hayakawa (February 24, 2011). "University of Oregon students demonstrate for fair labor practices, 2000-2001". Global Nonviolent Action Database. Swarthmore College. Retrieved May 19, 2014. ^ a b Alan Pittman (November 16, 2000). "Swoosh Goes Worker Rights". Eugene Weekly. Archived from the original on May 19, 2014. Retrieved May 19, 2014. ^ "Statement from Nike founder and CEO Philip H. Knight regarding the University of Oregon". Oregon Daily Emerald. April 24, 2000. Archived from the original on March 11, 2009. Retrieved March 24, 2009. ^ Romano, Ben (September 25, 2000). "Great debate: WRC vs. FLA". Oregon Daily Emerald. Archived from the original on June 11, 2007. Retrieved March 24, 2009. ^ Friedman, Thomas (June 20, 2000). "Foreign Affairs; Knight Is Right". The New York Times. Retrieved March 24, 2009. ^ Peterson, Anne (November 19, 2004). "Nike's Phil Knight resigns as CEO". The Seattle Times. Retrieved March 24, 2009. ^ "OTL: Phil Knight and Oregon" (Flash video). Outside the Lines. ESPN. April 2, 2008. Retrieved November 12, 2009. ^ "Oregon Names Kilkenny Athletic Director". GoDucks.com. February 14, 2007. Retrieved June 1, 2008. ^ "Knights to give $100 million to OHSU Cancer Institute". Oregon Health & Science University. October 29, 2008. Retrieved November 12, 2009. ^ House, Kelly (October 28, 2010). "Nike founder Phil Knight donates millions to Catlin Gabel School in Cedar Mill". The Oregonian. Retrieved January 14, 2017. ^ Brown, Kate. "Oregonians For Higher Education Excellence". Oregon Secretary of State. Retrieved May 23, 2012. ^ Jaquiss, Nigel. "Tim Boyle, Pat Kilkenny Ante Up For Higher Ed PAC". Willamette Week. Retrieved May 23, 2012. ^ Jaquiss, Nigel. "New Political Action Committee Will Focus on Higher Ed". Willamette Week. Retrieved May 23, 2012. ^ Hammond, Betsy. "Huge Phil Knight donation to University of Oregon tonight? 'Exciting,' 'historic' invitation-only event spurs rumors". The Oregonian. Retrieved October 29, 2014. ^ "Phil and Penny Knight to OHSU: $500 million is yours for cancer research if you can match it". Oregonian. September 21, 2013. Retrieved October 1, 2013. ^ "Knight Challenge Nets Oregon Health & Science University $1B for Cancer Research". ABC news. June 25, 2015. Retrieved June 25, 2015. ^ "Campus Tour". Marylhurst.edu. Archived from the original on September 24, 2015. Retrieved September 29, 2015. Knight's Green: A sprawling green lawn, named in honor of Nike's Phil and Penny Knight whose generosity made possible the Marylhurst Knights Opportunity Scholarship Program. ^ "Phil Knight gifts $112 million in Nike (NYSE: NKE) stock - Portland Business Journal". www.bizjournals.com. Retrieved December 30, 2016. ^ "Philip H. Knight - Special Contribution". Oregon Sports Hall of Fame. Retrieved June 28, 2011. ^ Bachman, Rachel; Hunsberger, Brent (May 4, 2008). "Phil Knight's influence transforms University of Oregon athletics". The Oregonian. Retrieved June 1, 2008. ^ "Phil Knight recognized by AAAS for business and philanthropic contributions". Around the O. April 22, 2015. Retrieved February 13, 2016. ^ "American Academy of Arts and Sciences - Newly Elected Members" (PDF). American Academy of Arts and Sciences. April 2015. Retrieved February 13, 2016. ^ "Phil Knight: How He Empowers Others", The Woman's Conference. Accessed: May 13, 2012. ^ Kai Acevedo (January 4, 2016). "Nike's Phil Knight Lists California Home for $2.5 Million". hauteresidence.com. Haute Media Group. Retrieved May 1, 2018. ^ Daniels, Jeff (November 6–7, 2018). "Oregon's Democratic Gov. Kate Brown wins re-election against GOP challenger Knute Buehler: NBC News". CNBC. Retrieved November 14, 2018.